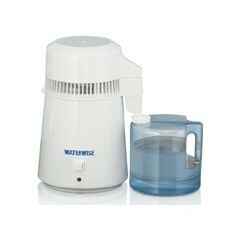 A compact and portable countertop water distiller appliance, that is widely used for water purification via distilation. One simple electrical pug-in to household power is the only connection required for use. Simply fill the stainless steel boiler with tap water and press the start button. Water is distilled and stored in a glass collector/storage bottle. 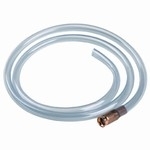 Produces 1 gallon of distilled water in 4 hours. Has automatic shutoff after each one gallon cycle. White with clear glass bottle 800 watts.